Do you have a passion for teaching CPR and first aid? Are you attracted to the prestige of being part of an elite group of Emergency First Response Instructor Trainers? If so, you may be interested in becoming an Emergency First Response Instructor Trainer. As an Emergency First Response Instructor Trainer you’ll have the opportunity to expand your passion of teaching and increase your income by training others to become Emergency First Response Instructors. Be an active EFR Primary and Secondary Care and Care for Children Instructor. Have issued 25 Course Completion Authorization cards for any EFR course, or have taught at least five separate EFR courses. The EFR Instructor Trainer course is based on the same instructional design and educational protocols as other Emergency First Response courses, It is designed for busy people and has built in flexibility. Instructor Trainer candidates accomplish knowledge development through an online program that is flexible and easy to understand so they progress at their own pace and complete the course as their schedule permits. The online component is followed by a live practical training session with a current EFR Instructor Master Trainer. To get started, contact your Emergency First Response Regional Headquarters to register for the course. After registration, you’ll receive your EFR Instructor Trainer materials and a web link to the online knowledge development course. The online course consists of three curriculum presentations and a Self-Study Knowledge Review. 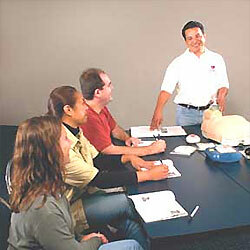 You also have the opportunity to develop a basic marketing plan for your EFR provider- and instructor-level training. After completing the online portion, it is simple to complete the course by attending a prescheduled EFR Instructor Trainer Practical Session available in your area. You can complete these sessions in about four hours. For more information about practical session course dates and locations, contact your Emergency First Response Regional Headquarters . During the practical sessions, candidates discuss their marketing plan and consult with an EFR Instructor Master Trainer to help develop a successful instructor training business. Candidates also participate in hands-on teaching demonstrations and positive coaching techniques. The practical session concludes with an evaluation of the Self-Study Knowledge Review completed during the online course and a written final exam. After you successfully complete the practical session, you may submit your EFR Instructor Trainer application. Once you are notified that Emergency First Response has approved your application, you are authorized to advertise and offer Emergency First Response Instructor courses. For more information about becoming an Emergency First Response Instructor Trainer, and for course dates and locations, contact your Emergency First Response Regional Headquarters.